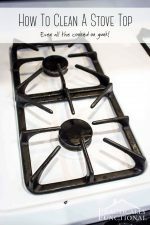 I love cast iron cookware, but it can be slightly tricky to take care of. 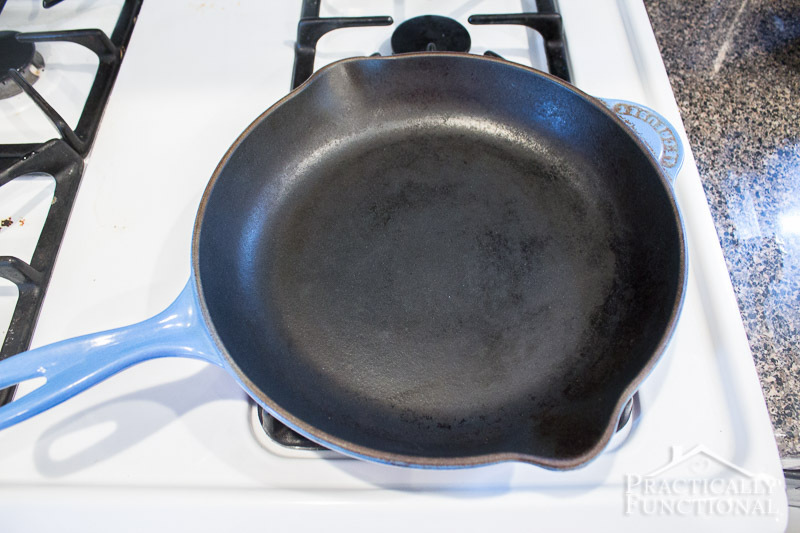 If you don’t use your cast iron skillet often, it can get rusty just from the atmosphere. If you do use it all the time, it only gets better with age, unless you wash it with soap and remove all that “seasoning”. But don’t worry! 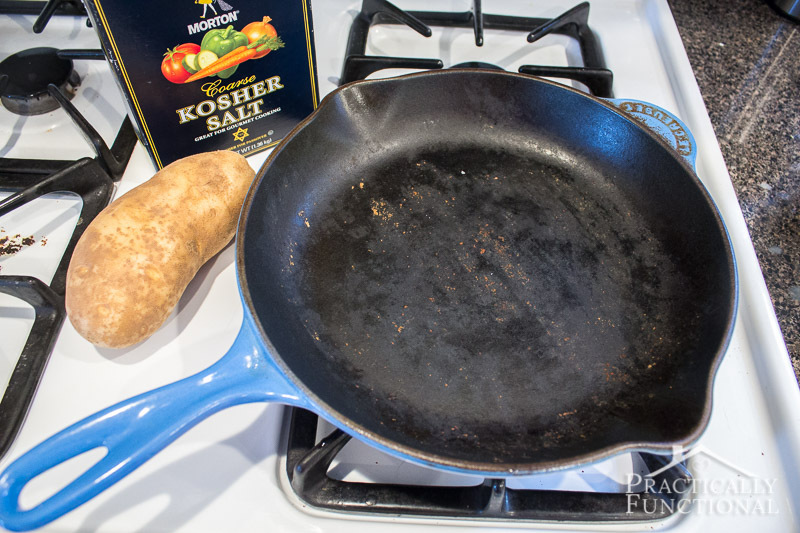 If your cast iron skillet is rusty, dirty, or just needs a little bit of love, it is super easy to clean and season a dirty or rusty cast iron skillet with just a few household items! We use our cast iron skillet a lot, so it doesn’t have a lot of time to sit around getting rusty. But every once in a while it does get SUPER dirty and kinda “dry” looking, and I know that means it’s time to clean and season it again! 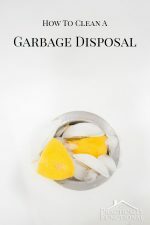 NOTE: This whole process can get a bit messy with salt flying everywhere, so depending on how dirty your pan is, you may want to do this outside or in the sink or put a newspaper down to contain the mess. Start by rinsing out your pan with water, and then dry the pan with a paper towel to remove any large gunky bits. 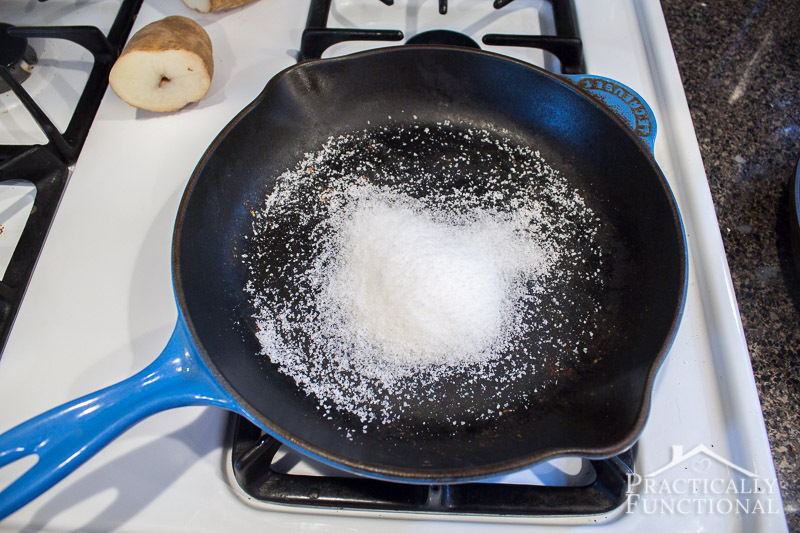 Then pour a bunch of coarse salt into the pan (about 1/4C to 1/2C, depending on how dirty or rusty your pan is). Cut the potato in half and place it cut side down into the pan, on top of the salt, and use the potato to scrub the pan. Keep scrubbing, using a good amount of pressure, and you’ll see the dirt start to come up in the salt. 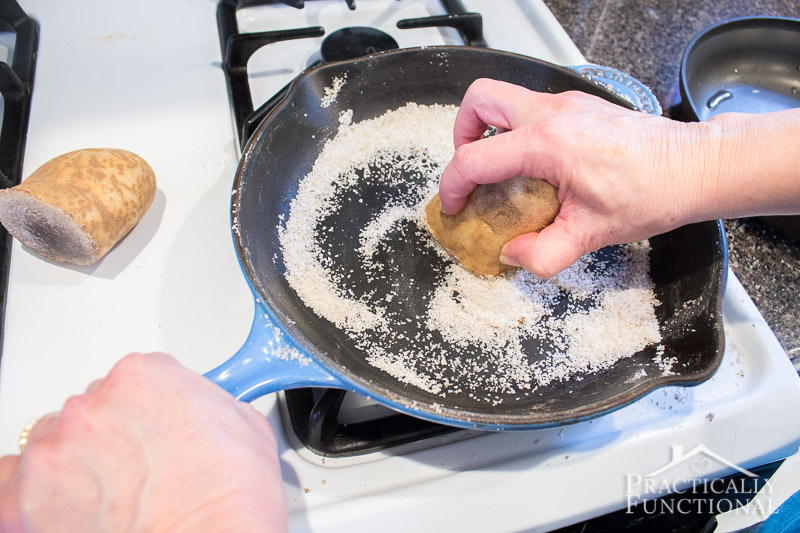 The potato is just wet enough to help “activate” the salt so it can really get at that rust and dirt! Scrub your entire pan until it’s clean! 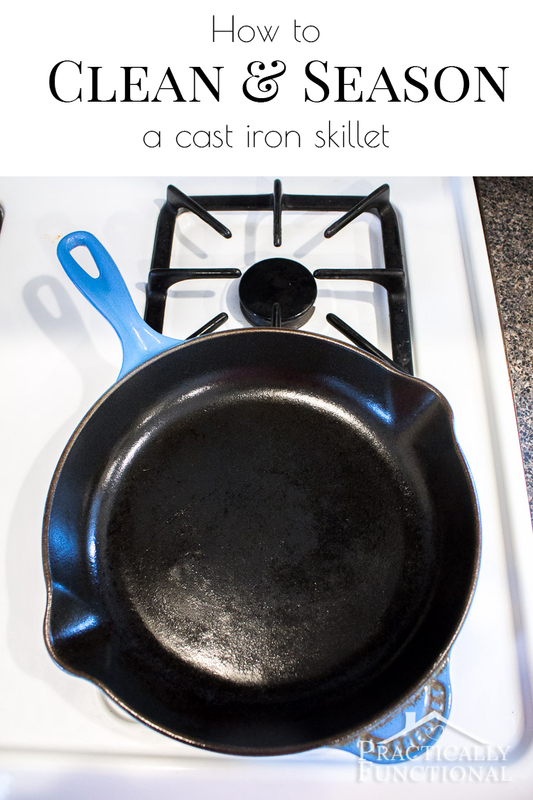 (If the handle, outside edges, and bottom of your pan are cast iron instead of enamel-coated like mine, make sure you scrub all those parts too.) If your salt gets really dirty, rinse the pan out with water, pat it dry with a paper towel, and start over with a new batch of salt. Once the pan is completely clean, rinse it out, pat it dry with a paper towel, and set it on the stove over low heat for two minutes to help completely evaporate any remaining moisture. Once it’s dry, it’s time to season the pan! See how dry the pan below looks? It’s totally clean, but it doesn’t have any “seasoning” in it to help keep your food tasting great and to keep it from sticking when you cook. 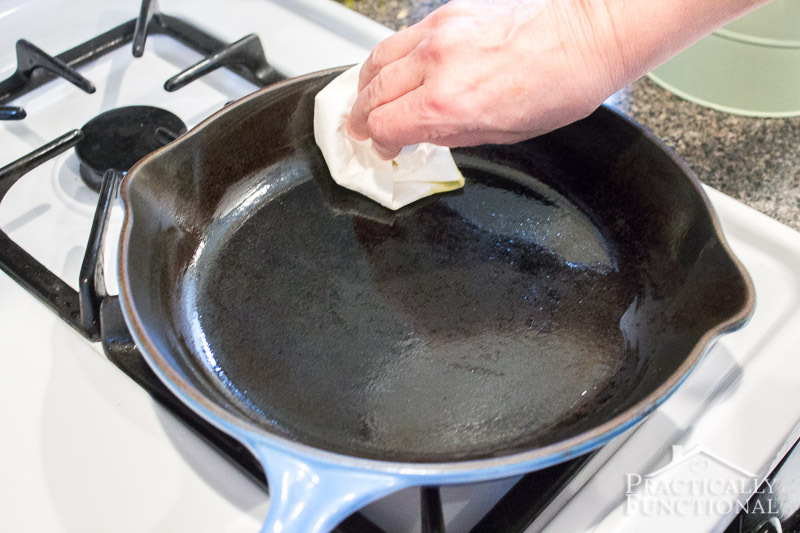 Pour a small amount of oil into the pan, and rub it around over the entire cast iron surface (handles, outside, and bottom too if they aren’t enamel-coated!) with a paper towel. 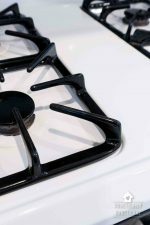 Keep rubbing the oil in until all cast iron surfaces are coated, then wipe out any excess oil with a clean paper towel. Set the pan back on the stove over low heat for 30 minutes to help the oil really soak in. 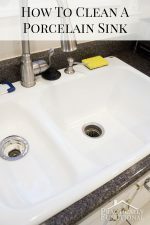 After half an hour, wipe out any extra oil with a paper towel again, and then you’re done! See how much better that pan looks now?! If you really want to take care of your pan, season it with oil and heat like this after every time you use it. You don’t need to clean it out with the potato and salt every time, but the oil is really great for it, and you can’t do it too often! 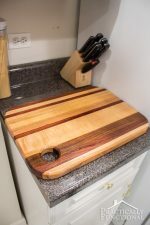 If you really want to take care of your pan, but don’t have time to oil it every single time, no worries! Just oil it whenever you have some time, and it will keep your pan nice and “healthy”! 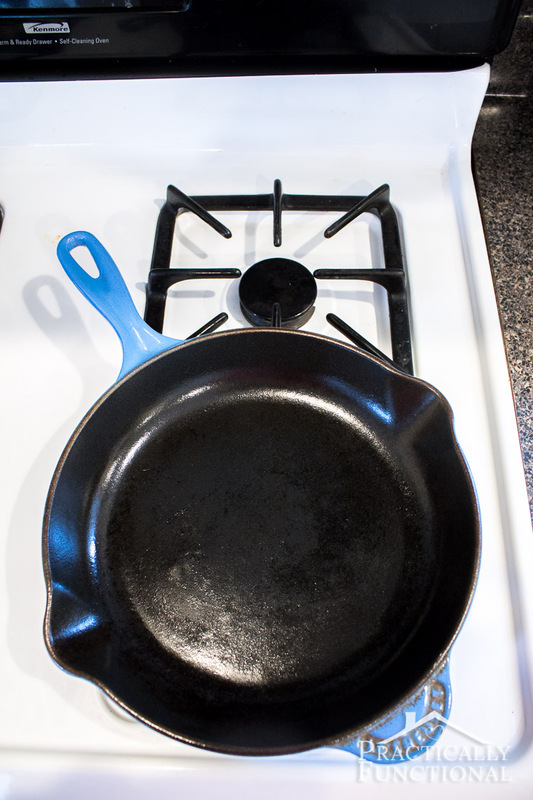 The best way to keep your pan from getting rusty again is to store it somewhere dry, away from any extra moisture. But if it does get rusty again, just grab the salt and a potato and scrub it clean again!